This lakeshore cabin was once a navigation point for steamships on Superior, and now serves as the focal point for a truly enjoyable Minnesota vacation. Black Point is located near Cascade Beach Road in Lutsen, MN. Come stay at this historic home on Lake Superior. Enjoy 180 degrees of Lake Superior views. Take a stroll down the path to the beach. Firewood is included. Enjoy 1500 feet of ledge rock/cobblestone beach. Enjoy your time on this lovely beach. Enjoy trees and wildlife right from the porch. Sit on the deck and watch the sun rise over Lake Superior. Gorgeous views for a great Minnesota Log Cabin. Beautiful unique stone fireplace provides warmth for cold nights, firewood included. Enjoy the simple life in this historic cabin. The home`s kitchen is a great place to prepare a meal together. The master bedroom features a queen bed. This incredible Minnesota vacation log cabin, along the North Shore of Lake Superior in Lutsen, MN, was once an historic navigational point for steamships. The very comfortable cabin is the true definition of rustic, made from logs many years ago. Yet this log cabin is exactly what many vacationers are looking for when they head for the Superior National Forest, and they don't mind the lack of TV and phone service. Along a path from the cabin, and only a few yards away, you will find a cobblestone beach where you can enjoy the majesty of the Big Lake. Be aware that the path is somewhat steep. A deck with a charcoal grill will allow you to enjoy cooking inside or out, while keeping an eye on the Lake, as well as the forested surroundings. Inside the cabin, a stone fireplace with a wood stove insert allows for a very cozy source of heat. An electric heater has been added to the cabin for your comfort. The log cabin is closed for the winter. Black Point is located near the very popular Cascade Beach Road area, just 10 miles north of downtown Lutsen near Cascade State Park. The cabin is just 12 minutes to Superior National at Lutsen Golf Course and Lutsen Mountains Ski and Recreation Area, which offers many activities in the summer months including an alpine slide and sight-seeing gondola to the summit of Moose Mountain. Take a short drive up the shore to Cascade River State park where you will find an enchanting waterfall after a short, easy hike. You are close to many dining options including the Lakeside Dining Room and Poplar River Pub at Lutsen Resort, Moguls Grille & Tap Room at Caribou Highlands, and Papa Charlie's Restaurant & Tavern at Eagle Ridge Resort. All of which features live music from popular local musicians throughout the year. Grand Marais is just a 15-minute drive up the shore where you can spend a day shopping and dining in the town's many unique shops and restaurants while enjoying a hike out to Artist's Point or just a stroll around the Harbor. Whether your goal is to relax or to go on an adventure- Black Point is a great place to be. 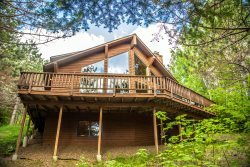 Please call our office at 218-663-7971 and talk with one of our friendly rental agents to book this log cabin. Black Point has special meaning to us because it was originally built by A relative. We come every year and love everything about it, the views, the wilderness, fresh air and wildflower smells , the beach and the sounds of the lake. Solitude and proximity to cascade and Grand Marais. Had no problems and the one time we conversed they were very helpful. Very nice. Great location. We enjoyed to fire nightly and appreciated the provided wood. The location was perfect. That was the thing we liked the best. The pathway down to the beach was overgrown from the plants and trees that made it hard to get down there. However, once there it was the best thing about the cabin-Lake Superior! We didn't cook out or use the kitchen because we were constantly exploring the surroundings that North Shore has to offer, so we cannot speak to that. The King Size bed was comfortable. We absolutely loved the history of the cabin and the fact that it was shared through a book. Thank you so much. It was such a spiritual oasis. The site is beautiful. The service responsive and polite. The site was beautiful. The location was wonderfully quiet and exquisitely close to the shore. No better (more enjoyable) have been any of our vacations previous to this one. Did I mention the site was beautiful?! please keep this place as it is. No TV's no electronics or internet! we chose this cabin for that reason. every once in a while you need to get away from all of that.